The dress fit well and was beautiful! I received it quicker than it was promised and was in great condition considering the long journey. I would recommend purchasing from this amazing site, I was extremely satisfied with the quality and price. Absolutely love the dress! I ordered custom measurements and it fits perfectly. I cannot wait to wear it on my wedding day. Also, they have amazing customer service I originally ordered a dress but I did not notice they did not have it in white and they immediately helped me and changed my ordered and refunded me the difference. This dress was fantastic! I used the custom option and it was a perfect fit. The top part of this dress was so elegant and far more spectacular than the online pictures. The fabric for the dressheavy and fell well. I was concerned about the quality. The quality was very good. My wedding was small with several family members. We'll have a large reception for friends and family. I plan to order another dress for that event. I love the dress I got from uk.millybridal.org. Simply meet my desires and it means everything to me, i can't wait to be stunning on my big day, and i really wanna show my bridal look with this gorgeous dress. 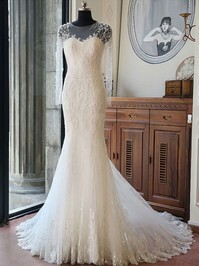 If anyone is speaking of buying a wedding dress, I will recommend uk.millybridal.org hands up. LOVE my wedding dress! I have to say that this is the best wedding dress i could ever get for my big day! I had this dress custom made and sent to UK and it fits perfectly and material is of great quality. Can't wait to wear this dress on my big day! This dress is beyond what I expected. The fit of my dress is perfect. Never would have thought I would find my wedding dress from the internet and it would look exactly like the picture on the website. I will definitely recommend uk.millybridal.org to all my friends for their wedding or special occasion needs. I ordered this dress with the custom measurements and it showed up really quickly. It looked just like it's pictured even more beautiful on me. I would recommend MillyBridal to anyone who are looking for gorgeous wedding dresses! Thank you guys! What a beautiful dress. Ordered it for my daughter in law to be. We had it custom made because she is 6'2" tall and very thin. It fits her perfectly. The quality is amazing and we could not be happier! Perfect for a wedding! Beautiful dress. Love it and recommend this dress to everyone!